That was an unintentionally long blogging break. I knew this blog would take a back seat to Wedding Planning & I don’t really expect that to change over the next month either. Speaking of which, we’re less than a month away from the big day. A month, guys! Isn’t that crazy?! I haven’t blogged a ton about our wedding or the planning – there are more than enough blogs out there that can tell you how to plan a wedding & I am no expert here. Maybe once it’s over, I’ll talk a little bit about what we did. It’s turning out to be a big mix of DIY & non-DIY. Let’s talk about the first “wedding event” though, shall we? Last weekend was my bachelorette. We kicked things off at Hotel Arts on Friday, grabbing some cocktails by the pool despite the somewhat blustery day. The patio around the pool belongs to Raw Bar, which H & I were really excited about. We tried their Beef Short Rib Steamed Buns & they were awesome. We also ordered cocktails, all of which were delicious. I’d really love to try more of their menu sometime. As more girls arrived & dinner time approached, we headed up to our room & ordered pizza from Bocce. None of us had tried it yet, but they were one of the few upscale pizza places that deliver so we went for it. Personally, I was quite impressed with their pizza: the crust was good, they had a good assortment of options, & they came right to our room. I’d definitely try them again. We ordered the Margherita, the Funghi, the Boschetto, & the Calabrese, I think (I didn’t do the ordering myself). They were all really good, but I think the Funghi & the Boschetto were the biggest hits. We spent the rest of the night listening to music, chatting, playing games, & eating. We even took a little swim break right before the pool closed. We just had to get in there once over the weekend! It was a great start the weekend. We mostly managed to sleep in the next morning, rolling out of bed around 10:30 am (although we had been woken up pretty early by some loud hotel construction that the front desk apologized for. Still – jackhammers at 7 am?) & heading down to brunch/lunch at Yellow Door Bistro just before noon. I decided to prepare for the day’s activities with steak frites – not your typical brunch fare, but it was pretty much lunch anyway (& the steak at Yellow Door is delicious). After we ate it was pretty much time to get ready. People started to arrive to join us for drinks & some primping & before I knew it, it was time for the limo. The girls had rented a limo bus for two hours to start things off. We’d done the same for H’s Bachelorette & it was one of my favourite parts of the evening. We actually had the exact same limo driver as we did two years ago & the experience did not disappoint. We drove around Calgary, blasting music, dancing, making speeches, & sharing drinks. We stopped for pictures in Crescent Heights & took a bathroom break at my Matron of Honour’s parents’ house before our second photo op at my High School. 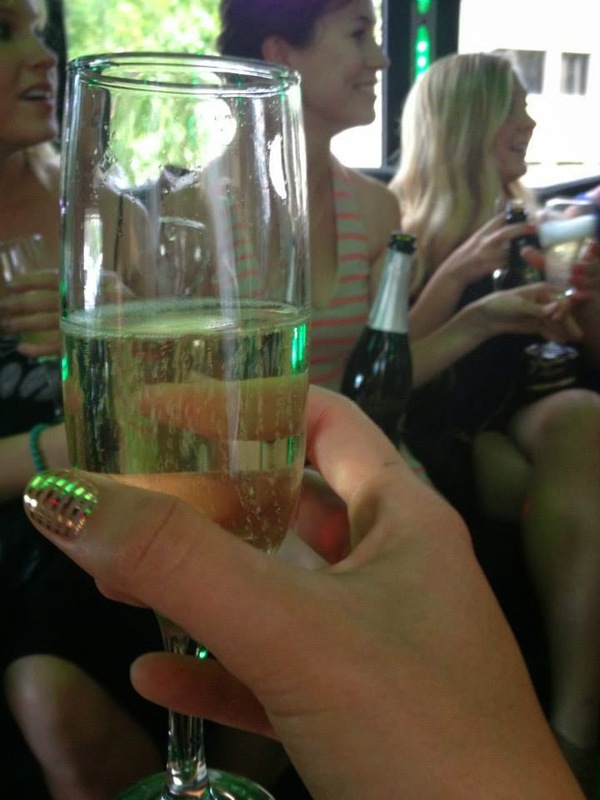 Starting the limo ride with champagne for all! When the two hours were up, the limo dropped us off at WURST for dinner. We were downstairs at a long table in the beer hall. It’s really the best place to be – there’s an oompah band on Saturdays & they never fail to entertain. After dinner, they came over & had me standing on the bench, drinking my boot, as they played Here Comes the Bride. It was quite hilarious. Sufficiently full of “German” cuisine, we hopped in a couple limos & headed to our next stop: Cowboys. For most of us, it had been a long time since we’d been inside Cowboys. Most of the girls hadn’t actually been to this third iteration, since it was more our style when we 18 & 19. It ended up being a really great time. There were a few more shots (mostly at the insistence of the Cowboys’ managers) & a lot of dancing. H & I stayed until the lights came on & then headed over to Tubby Dog for a “night cap”. I called that one. It wouldn’t have been a proper bachelorette without Tubby Dog at some point. It was an incredible weekend! I felt so spoiled the whole time (& a bit like a celebrity with everyone wanting to be in photos with me!). It had been a while since I’d had a girls’ night, let alone a girls’ weekend. I definitely need to do that more often. Sometimes girltime is the best time. Thanks to all the girls who made my weekend such a success, & especially to my amazing Matron of Honour & wonderful bridesmaids. I love you ladies! !